Isolation amplifier refers to a differential amplifier which helps in the measurement of small signals that are present in a high common mode voltage. The electrical designs with high voltage flow or current flow need to reduce potential risks to the users. The various measures of protection include isolation, grounding, and insulation of fatal voltages. The market has been segmented by application and end user industry. Based on the application the market is segmented into current sensing, voltage sensing, and others. On the basis of end user industries, the market is classified into automotive, telecommunication, industrial, and others. Rising adoption of cloud computing and expanding high speed telecommunications network is expected to remain key growth driver during the forecast period. Furthermore, the smart devices has led to the development of connected devices which provide real time data to the users. However, the installation of reinforced isolated amplifiers involves high initial investment and is not viable for small and medium business units. The overall market is also presented from the perspective of different geographic regions and the key countries in each region. North America is the dominating market which held a major revenue share in 2017, owing to well-developed telecommunications sector and urbanization in the form of intelligent buildings and smart transportation. APAC is estimated as fastest growing market during the forecast period, driven by expanding telecommunications industry and rapid adoption of smart buildings across the various developing economies. 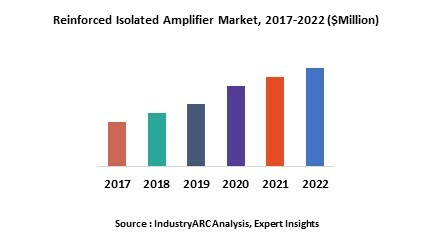 The methodology for estimating the reinforced isolated amplifier market involved demand in the various industries. The segmentations have been cross-mapped extensively to understand various market dynamics. Simultaneously, the companies involved at integration and distribution level were also studied from the perspective of their services, geographical presence, annual turnover and few other parameters to substantiate the estimations. All these estimations were further validated through primary research and industry experts.